Farmers’ markets are used by farmers worldwide to directly sell their produce to the consumer though as food production in the U.S. became industrialized, they were replaced by brokers and supermarkets. However, farmers’ markets have been regaining their popularity in the past two decades. In 2004, the U.S. Department of Agriculture reported that there were 3,100 farmers’ markets in the United States, a 79% increase over 1994. Retails sales of produce from farmers markets were $888 million. This represents 93% of total sales at farmers’ markets. Average sales were totaled at $312,0003. One of the reasons for this increase is that, “more and more people care about where their food comes from,” according to Patty Brand, executive director of The Friends of the St. Paul Farmers Market.4 In 2000, farmers markets had an average of 1,055 customers, up from 787 in 1996. Fifty-seven markets had an increase of customers while 14 percent had a decrease in customers3. Reasons for this increase include the notion that markets are popping up within all communities. Sixty-seven percent of customers live less than 10 miles from a farmers market while 19% were 11 to 20 miles away, 8% were 21 to 50 miles away, and 5% live more than 50 miles away from a farmers market3. A recent trend evidenced by the 19,000 farmers who sold only to consumers in 2000, finds many American farmers able to stay in business because they are selling directly. One reason farmers are going retail is that they make more money by setting their own prices, have more control over finances and can sell a higher percentage of their crop including bruised and less than perfectly shaped fruits and vegetables. Another trend is in the number of farmers’ markets that have popped up over the past few years. The number had risen from 499 in 1946 to 2,863 in 2000 and in 2004, the USDA reported that there were 3,700 farmers markets in the nation. Part of this trend is the rise in customers from 787 in 1996 to 1,055 in 20003. The growing popularity of farmers markets is not only with consumers and farmers, but with people who want to start their own businesses. 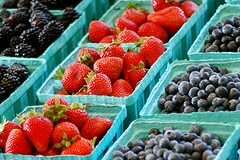 Farmers’ markets help people start or expand their business through an environment that includes relatively low start up costs. Farmers’ markets encourage many food lovers to build a customer base and test-market new food products. Farmers’ markets also help owners to hone their sales and display skills while finding out what attracts customers. Farmers’ markets are important in the food system because they provide a market for farmers and customers to buy and sell fresh fruits and vegetables. Seventy-nine percent (79%) of farmers have sales less than $10,000 and 31% of farmers use the farmers’ market as their only way of marketing products3. This means that farmers’ markets are an important market outlet for small to medium sized farms in the United States. Farmers’ markets are enjoying resurgence in popularity after having been replaced by supermarkets and brokers. Farmers’ markets are appearing in big cities and small towns. According to the U.S. Department of Agriculture, the number of farmers’ markets almost doubled in the last decade from 1,755 in 1994 to 3,137 in 2002.5 This popularity is due to consumers being less accepting of bland meat and produce from factory farms together with the relationship that they form with the grower. People are demanding fresher and locally grown product. There is also more attention being placed on health and the environmental with respect to antibiotics and pesticide use. In a 2003 study by the Leopold Center for Sustainable Agriculture at Iowa State University, the study said that if the price for products grown locally were the same as products grown far away, consumers were more likely to buy the locally grown products. Even though locally grown products cost more, more people are buying them because they consider them to be healthier and tasteful. 6 For example, in a supermarket it takes 18 days from the day the produce is picked to the day it is ready for purchase. Compare that to a farmers’ market where it is picked on a Friday and sold on a Saturday. In 1994, The U.S. Department of Agriculture started keeping track of all farmers’ markets in the country. 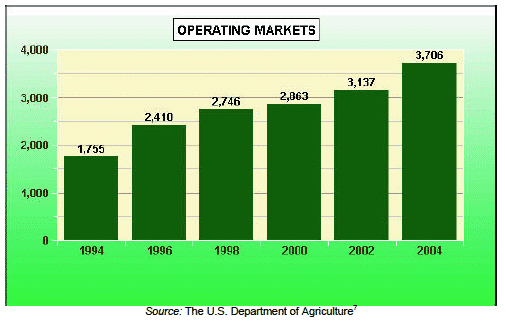 The graph below shows the growth in farmers markets from 1994 to 2004. So despite the fact that farmers’ markets once fell out of favor with the consumer because the supermarket offered more convenience, they are now making a comeback. Despite convenience, consumers are growing tired of products that are bland and have been sitting somewhere for several days. 1) “Fruit and Vegetable Markets.” Encyclopedia of American Industries. Online Edition. Gale, 2004. Reproduced in Business and Company Resource Center. Farmington Hills, Mich.:Gale Group. 2006. Date Accessed: June 2006. 6) Loviglio, Joann, Farmers’ Markets Keep Growing and Growing; As Popularity Increases Nationwide, So Do Numbers, Washington Post, 2005.